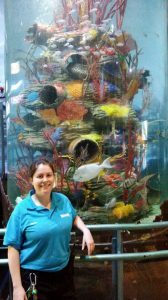 What is it like to be an Aquarist? I am an aquarist, which is the aquarium equivalent of a zoo keeper. 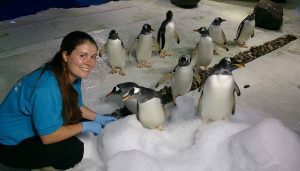 I work with all the animals which includes many types of sh, sharks, otters, turtles, an octopus, and my favourites – penguins! Being an aquarist is a very varied job. One day I will be making a toy for the penguins, the next day I might be building a new home for some baby zebra sharks or looking after 1cm-long baby seahorses. I went to university to study a degree in animal biology. While I was at university I also volunteered with animals whenever I could. I worked with horses, farm animals and domestic animals like cats and rabbits. 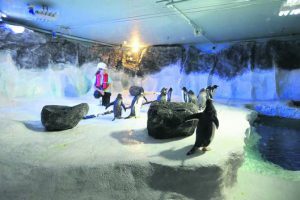 I then started volunteering for SEA LIFE and I realised that was the area I wanted to work in. When a position became available, I applied straight away. I love so many things about my job. The huge number of animals I get to work with is really exciting, and no two days are ever the same. SEA LIFE also have many aquariums all over the world, so I can build my career while travelling and living in exciting new places. I also love my team. Dealing with so many hands-on jobs really brings everybody close together. The hours are quite long and tiring, and a lot of the job is grubby. Sometimes the work is smelly, particularly the otter poo! It is also not a highly paid career. But the good points far outweigh the bad points. 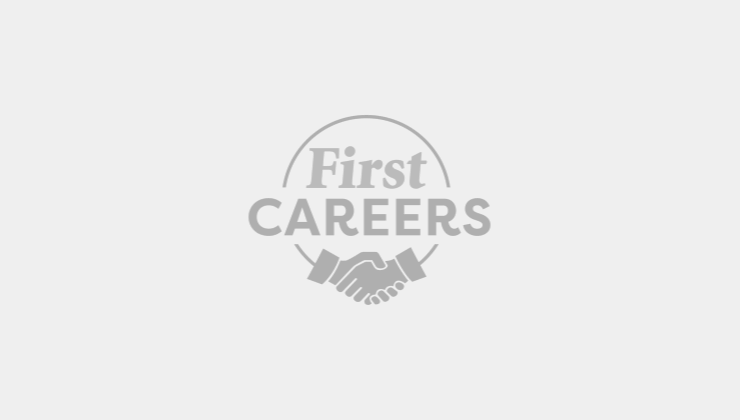 Most places are looking for someone not afraid to get stuck in and do the hard and dirty jobs. To show you can do this it is important to get some work experience. Volunteer with animals wherever you can. Also try a variety of species to see what you are good at and enjoy. You need to be physically fit, and good at observing animals to spot any changes in health or behaviour. Good GCSEs are very useful, plus a degree in a related subject, like animal biology, zoology or marine biology definitely helps. If you don’t want to go to university, you can also study on the job, particularly the Diploma in the Management of Zoo and Aquarium Animals (DMZAA). What is it like to be a Hotel General Manager? What does an Operations Director do? What's it like to be a Social Media Customer Service Advisor? What is it like to be a Pet & Reptile Operations Manager? What is it like to be a PR and Celebrity manager? What does a Youth Operations Manager do?